Quote: "Have you ever wanted to relive the adventures of those before you, and yet, at the same time, go beyond their path? That is why I am traveling." 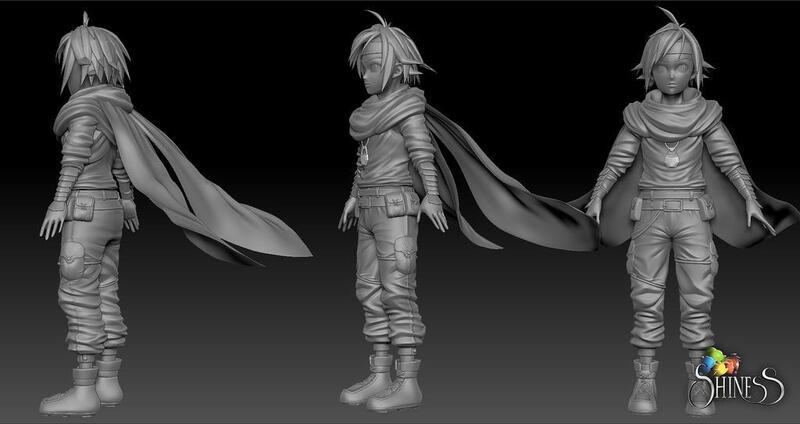 Profile: Growing up in the simple hunting village, the 14-year-old Reize was raised upon stories of exploration, adventure, and heroics by his father, once an well-known explorer and adventurer. His boldness and desire to prove himself led him to become a skilled hunter and develop an unconventional twin boomerang and self-taught martial arts style. 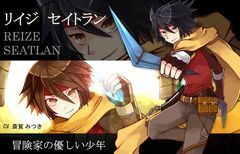 Enthusiastic and compassionate, Reize makes friends easily, and he is idealistically committed to his own imagined 'Knight's Code,' despite their ambiguity. Though his bumbling and lack of navigational abilities tend to cause him to show up at the wrong place at the wrong time, he is nevertheless eminently adaptable, and now on the path to becoming an explorer. Having learned that his vanished mother was a painter who could see things that other people could not, he now seeks out the clues with the hand-painted cards she left behind, hoping to discover her fate. Resourceful: Reize is good at using his surroundings to his advantage. Based on his location or what tools he currently has, he'll use his environment around him to make up for his disadvantages. 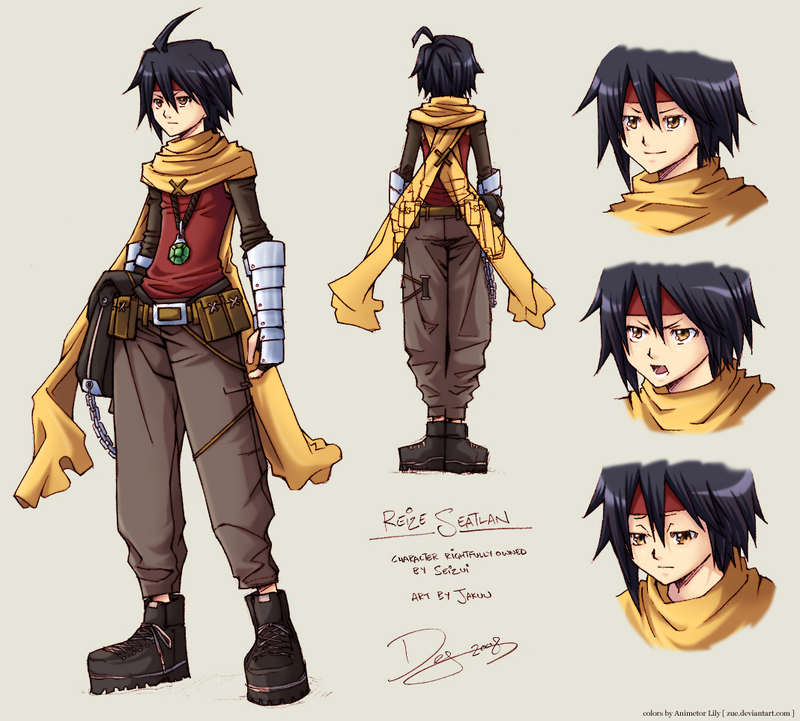 Compassionate: Reize has a heart of gold, willing to help a person, even at the expense of his own desires. Charismatic: That upbeat, cheerful nature of Reize tends to put people at ease. It is a natural charisma that tends to inspire strangers to follow him. 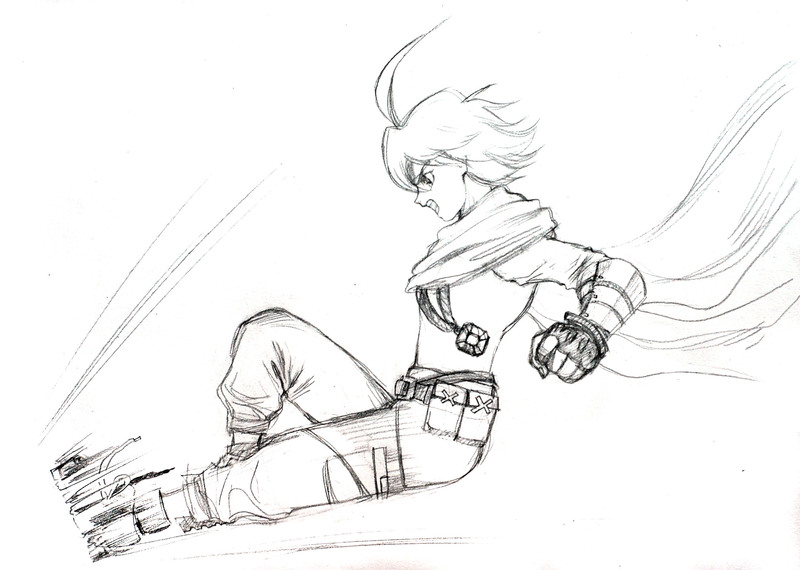 Reckless: Reize is prone to leap before he look. For better or worse, he tends to act on his emotions, often leading to hasty decisions that range from misjudging people to jumping into a situation at the wrong time. Naive: Reize is gullible and has a very bad judgment of character at times. He'll trust those that tend to be shady and will sometimes misidentify others as someone else. 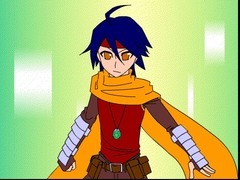 Nevertheless, Reize is young, inexperienced, and impressionable. It is easy to lure him into traps. Incompetent: This tends to be in terms of his ability to get lost and sometimes getting himself into messes. He is capable in his abilities, but he is not good at effectively utilizing his capabilities. Bad Luck: When Reize does not find trouble, it finds him. He has the knack of appearing at the wrong place at the wrong time. 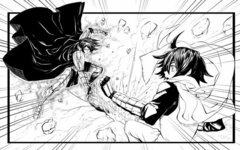 Whether it is a clash on the battlefield, a simple bar fight, or even a trap preparing to go off, luck always seems to position Reize in a way to get caught in the middle of the predicament. Even moreso, he ends up being the target of opportunity. However, the bad luck is more comical. Hydrophobia: Reize is deathly afraid of getting into the water due to his inability to float, let alone swim. 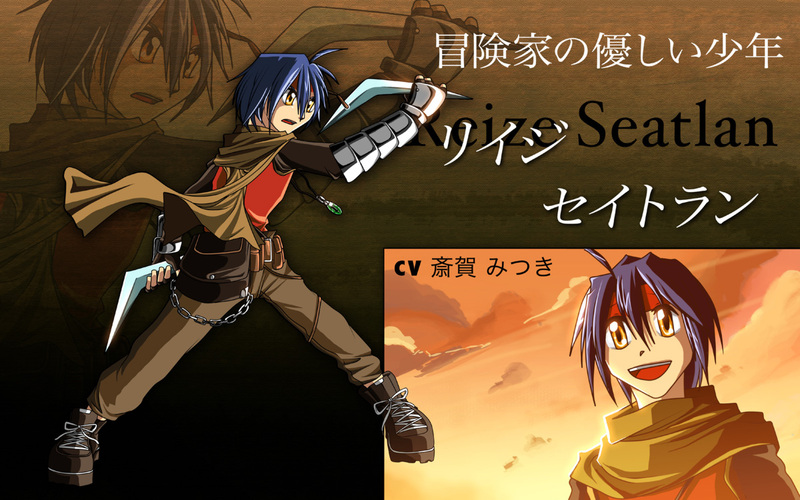 Seasick: Unfortunately, Reize is very susceptible to getting seasick when on a boat. 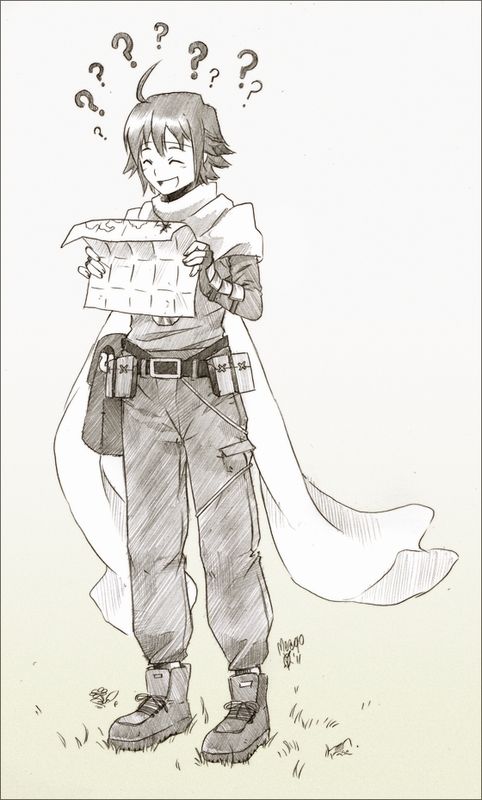 Navigation: Reize's ability to get lost knows no bounds. 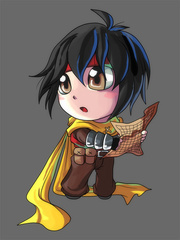 Even with the perfect map and the most sound instructions, Reize tends to get lost. Even worse, he'll often end up in the most unlikely places. Afraid of Killing: Although Reize was trained to kill animals for food, Reize is deathly afraid of taking another human's life. This goes as far as him being unwilling to perform the task, even if pressed. 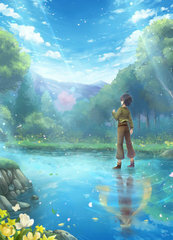 Reize had a simple life within the small hamlet; it was just him and his father living in a small and quaint house. To Reize, it was his father, him, and the hamlet. When Reize started to grow a bit older, Luan was able to share stories about his past adventures and explorations ranging from the people he met to the different cultures that he experienced. He told the story in pieces, often leaving the tales in cliff-hangers to leave his son wanting to know more. Reize loved hearing the tales and could not wait to hear more about them. 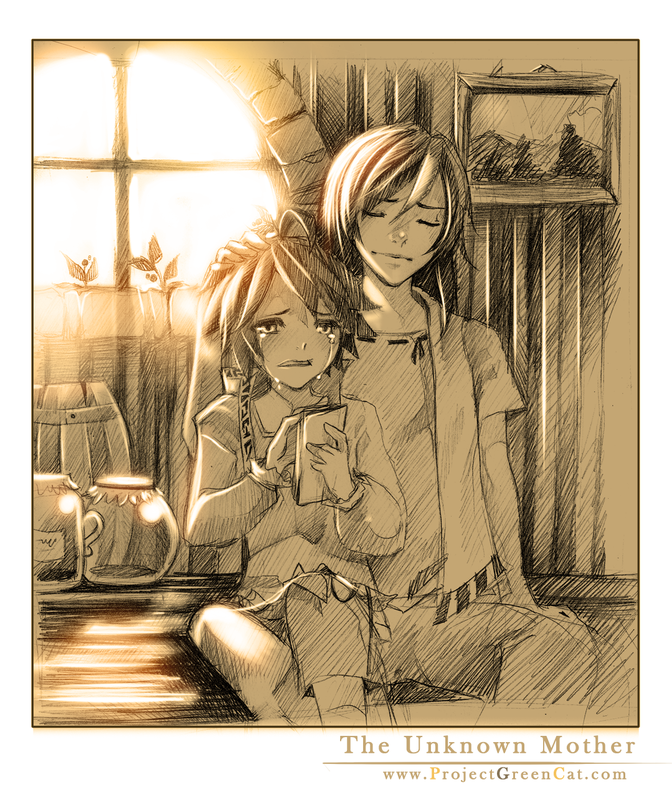 It filled him with pride knowing that he has a father who was once a brave adventurer and even a knight. 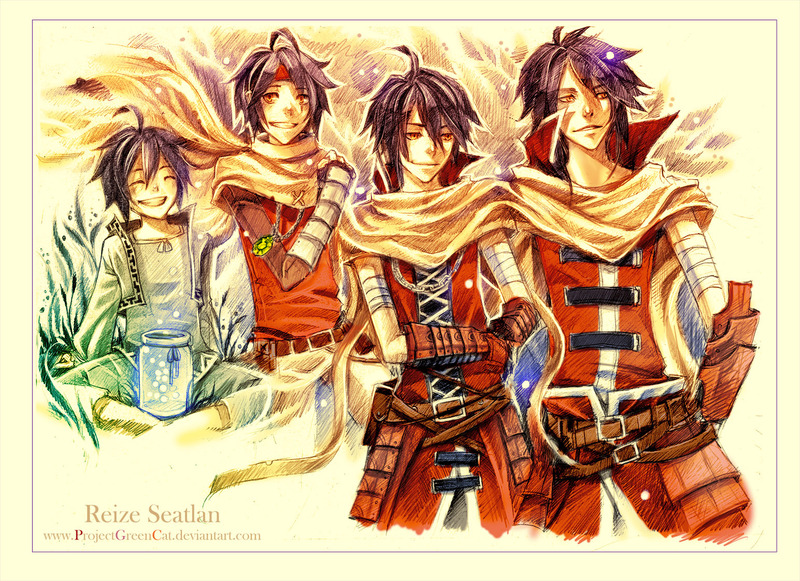 Those tales would inspire Reize to try to emulate his father. Within the hamlet itself, he was one of the few kids around. The younger children looked up to him due to his knowledge of the stories of his father's adventures. However, those of his age and older never took him seriously and would always harass him, resulting in fights and frustration. 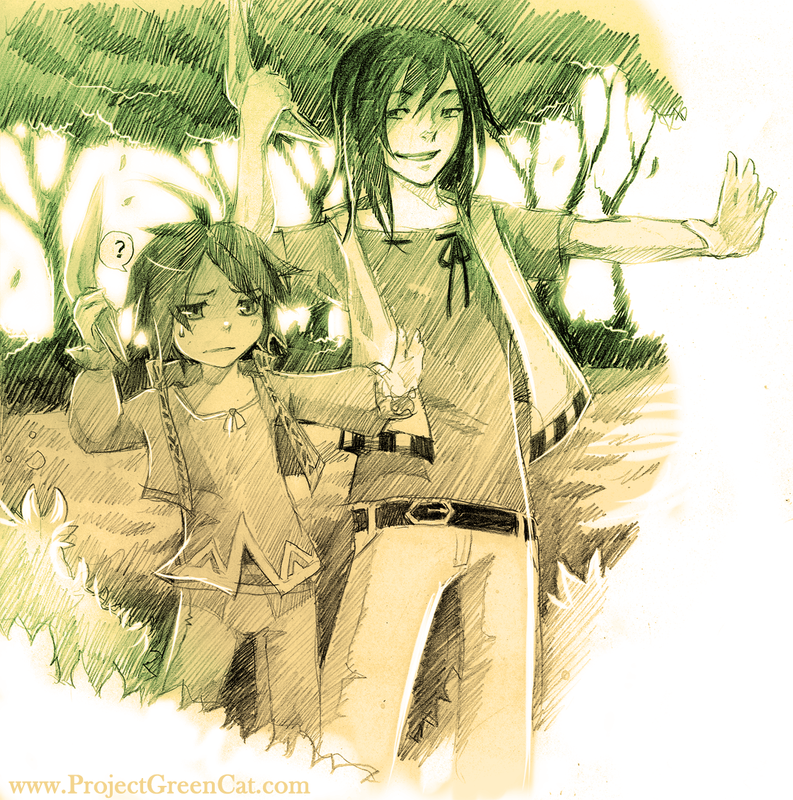 To develop Reize's skills, Luan taught him how to hunt. Reize learned the skills of the trade with a simple boomerang. Proud of his ability to hunt small animals with his boomerang, he sought to try to develop his 'style' of using the boomerang. Often, he thought of himself as a knight, using the boomerang as a sword to mimic how he imagined his father fighting. Always the one for outlandish ideas, Reize combined his hunting with his love for kicks, developing it into a self-taught martial arts-style. Reize decided to get himself a mark as proof. He brought back a small animal as his trophy from his hunt, telling the story as a grand adventure. It impressed the younger kids and while it did not impress the older ones, they eased up on their harassment. 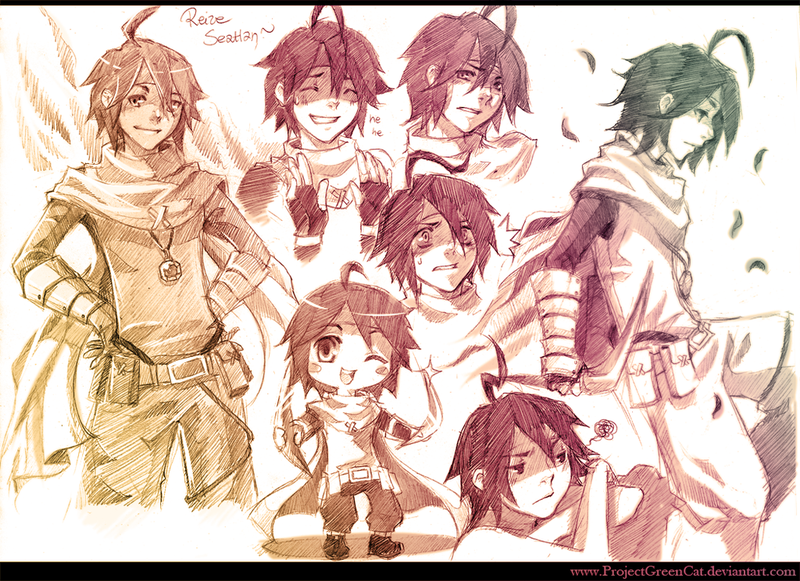 Over time, Reize grew popular amongst the younger kids for his bravery and bold personality. 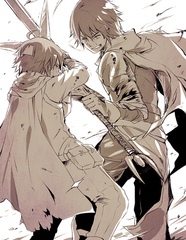 He grew to be the older brother-figure, always protective fo their well-being. He would often be referred to as 'Big Bro'. He developed a knack for storytelling, divulging his adventures to the younger children. 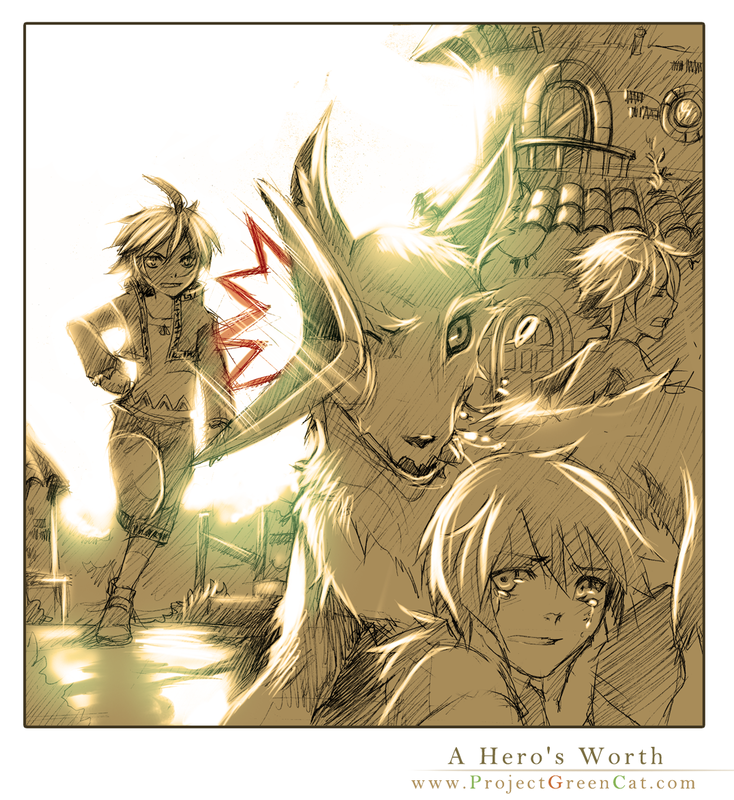 Reize never settled for just telling stories, but to emulate them as well. He often journeyed out of the hamlet and got into mischief. His exploits earned him the popularity amongst the children and the notoriety amongst the adults. His charisma made him the de facto leader. 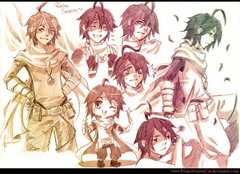 Due to the mischief driven from his desire to become an adventurer, Reize and his 'guild' were always a blessing and curse. But overall, the residence appreciated Reize making things not too boring for them. It was on his seventh birthday that he received a present: a deck of cards that had various paintings strange, mythical creatures. It was an amazing gift, originally thought to have been a gift from his father's trip. However, it was a revelation regarding that it was from his mother. Luan told Reize that of all of the places around, she wished to see Reize raised in Anelia. In his adventure, her met her and had Reize. However, she left the hamlet after his birth. 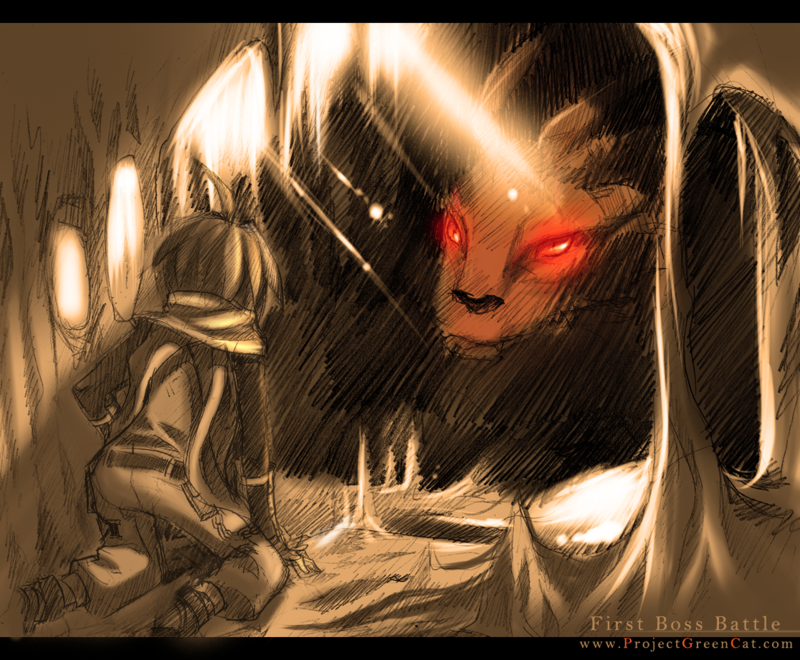 The paintings of the mythical creatures were from her own vision while she was expecting Reize's birth. 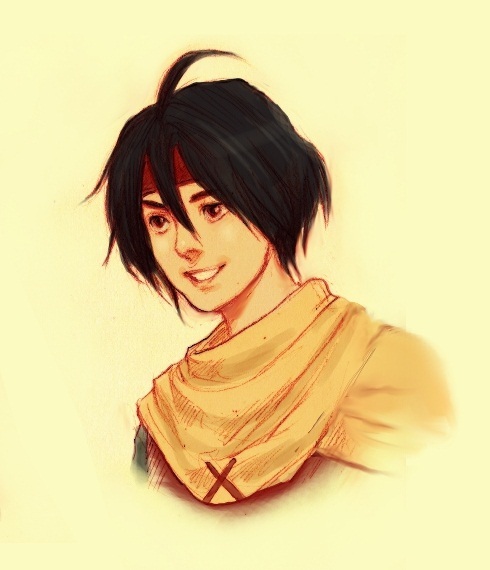 When Reize asked about her, he only told his son that she was a skilled painter who was able to see things in people that they themselves could not see, but would tell no more. This left Reize wanting to find out more about her, filled with unexplained questions. 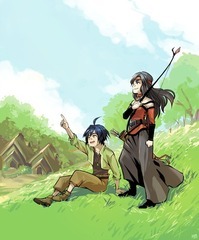 To keep Reize from growing rebellious and even hoping to curb his recklessness, Luan taught Reize about the Knight's Code; something he picked up from his travel that would hopefully inspire Reize with a moral guidance. This would prove to be true on how much it has integrated in Reize when the village had an incident. Luan went with the older villagers to assist them in their hunt, keeping guard to make sure no one was got hurt. A few wolves went to break into the village, looking to raid for food. Although the village watchmen were able to distract a large number of them, one managed to breach into the village. Few of the kids were out. Seeing potential dinner, the wolf attacked the kids, sending the village to a panic. Keepsake to the name of Big Bro, Reize jumped in to try to stop the creature, or at least distract it while the others escaped. 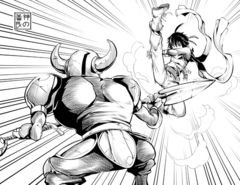 Although he was very young and far outclassed, Reize performed valiantly against the creature utilizing deception tactics as well as fighting head on with his martial arts and unique twin-boomerang style. However, the outclassed child was immobilized with a swipe of the wolf's claw. When the beast stalked to finish the prone Reize, Luan thankfully showed up in time to dispatch it. 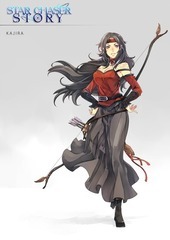 During the battle, word got out to the hunters of wolves breaching the village and the news of Reize battling one of them brought Luan into a frantic rush back to the village. When Reize woke up, he was surrounded by both older and younger kids, as well as his father. Luan was upset with Reize, given the stunt he pulled. However, the situation could not be avoided, due to the duress. In a way, despite of it all, he was proud of Reize's bravery. Luan gave him his pendant that he always wore with him. It was a keepsake of his journey. In essence, Reize felt like he was going in his father's footsteps. 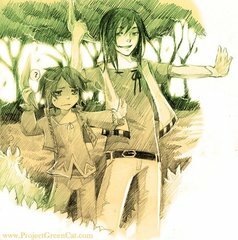 Reize performed a feat that earned the respect and admiration of the older children: his boldness proved true. 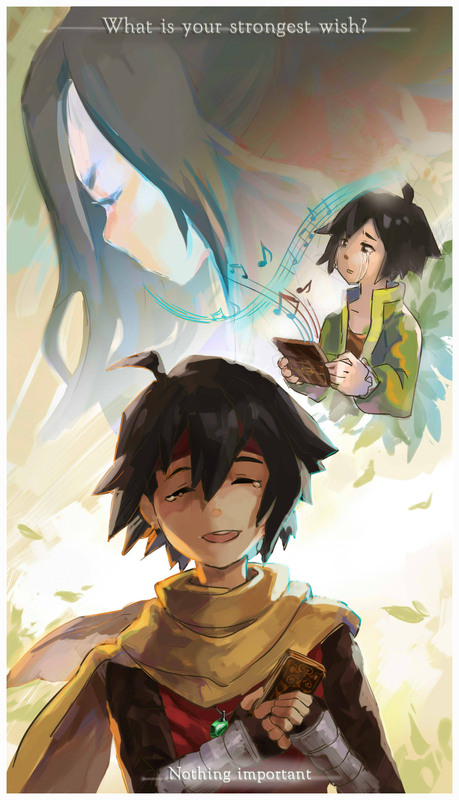 Although Reize's dream was to become like his father, time will pass by of dealing with living the uneventful life, the only dream of adventure would be through stories. It was the age of fourteen that his fate would change. 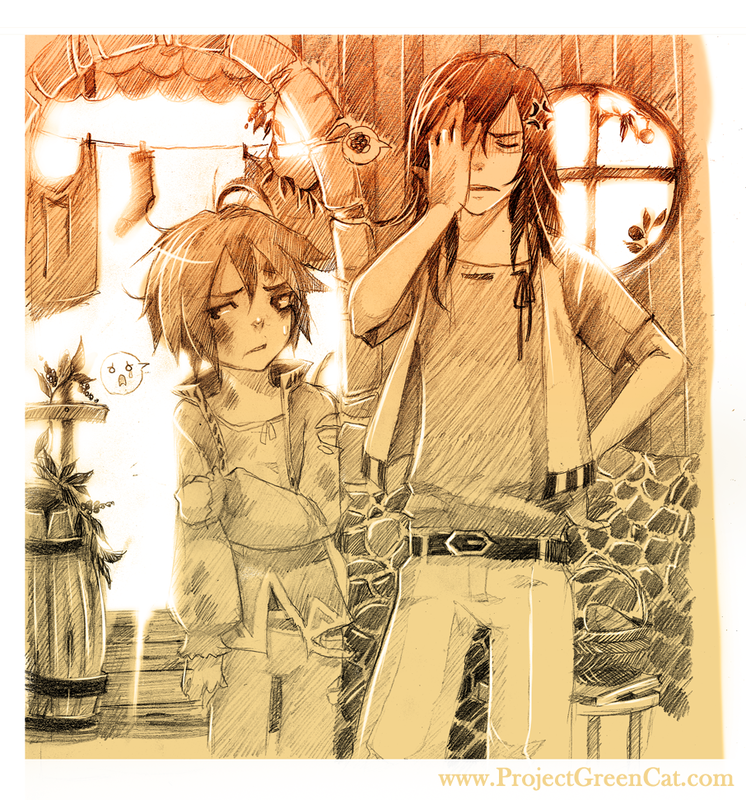 It was after an argument with his father that Reize was stuck doing chores around the house. He decided to play hookey; he escaped to relax on a raft that he built on a nearby river and drifted asleep. Unfortunately, the sleeping Reize was lead to a waterfall. While he woke up in time to see his fate, his vainful swimming left him to fall in. When Reize awoken, he found himself in a cold, empty, yet beautiful crystalized cavern. He wondered if he had died after his brush with death. However, he learned that he was not alone as when a massive creature revealed itself to the boy from the shadows of the cavern. The creature introduced itself as a Great Beast. Once it beared some familiarity, Reize compared it to the card that was painted by his mother. Although the boy expected the beast to jump at him, it surprised the boy that he spoke and was amused by Reize's survival. Its amusement ended when the beast recognized the pendant. The Great Beast recollected giving the pendant to a traveler, who Reize revealed to be his father. Annoyed, the beast told the child to hand it over. After refusing, the Beast challenged the child to prove himself. While Reize attempted to face the beast, his boomerang easily cracked before its shell, amusing the beast and leaving Reize horrified. Reize spent his time trying to survive the beast's attacks. Left in panic, a voice called out to him. That voice told Reize, "Open your mind, open your heart, and let the truth be revealed to you." 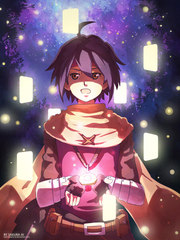 Through that advice, Reize was able to manifest the gift of the pendant, allowing him to draw upon its power to use magic. While it did nothing more than make soot on it, it impressed the creature. The Great Beast revealed that the pendant is a fragment of a shooting star. The pendant was a gift to Luan. However, he mentioned that the crystal also had a secret of its own, which was why he entrusted it to his father. Reize lamented over his broken wooden boomerangs. Amused, the Great Beast took the broken pair and dipped them into the water nearby. When they emerged, they were crystallized. Reize was uncertain as to how to use his boomerangs that were crystallized with their increased weight. The Beast told the boy that he'd figure it out. What caught Reize's attention was the Beast's after thought: a mysterious woman whose paintings often told came from her visions of the future. When Reize tried to inquire, he felt his will slipping from the combined exhaustion from the battle, manifesting magic, and the atmosphere of the cave. When he collapsed and entered a deep slumber, the creature moved the boy back towards his raft. It mused over the boy's desire for an adventure. So, it sent the raft along the ocean's path. He woke up at a forest, away from society and all on his own. The beach marks the beginning of his adventure. Around the general population, Reize can be preceived as an energetic, upbeat kid with an extrovert personality. He carries himself with full of vigor and optimism. He is pretty friendly and approachable, often more cheerful than he should be. 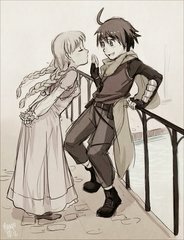 Often times, Reize is more likely to initiate the conversation because curiosity always draws him. He tends to be very expressive, his movements also emphasizing his facial and speeches. His manner of speaking is more informal, carrying no real familiarity with the customs and courtesies that the higher class seem to carry. He is sometimes a bit cautious over what he'll tell a person if it's something bad. In fact, he'd be hesitant and may likely sugarcoat it the best that he can as to not offend(and get them even more angry). He carries a childish sense of humor, but lacks the cruelty of the humor that kids would have. Most of that tends to be drawn to minor practical jokes, but can laugh at some of the silliest of jokes. Reize is not the most patient of person. This is likely due to the fact that he is very eager to follow on the feeling that he has. Sometimes, he wants to rush in and see what lies beyond the mysterious veil. Reize, however, carries a paternal demeanor to those younger than him. 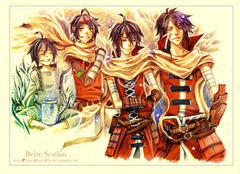 Part of it is due to the influence of growing up with younger siblings where he has to be the big brother of the group. 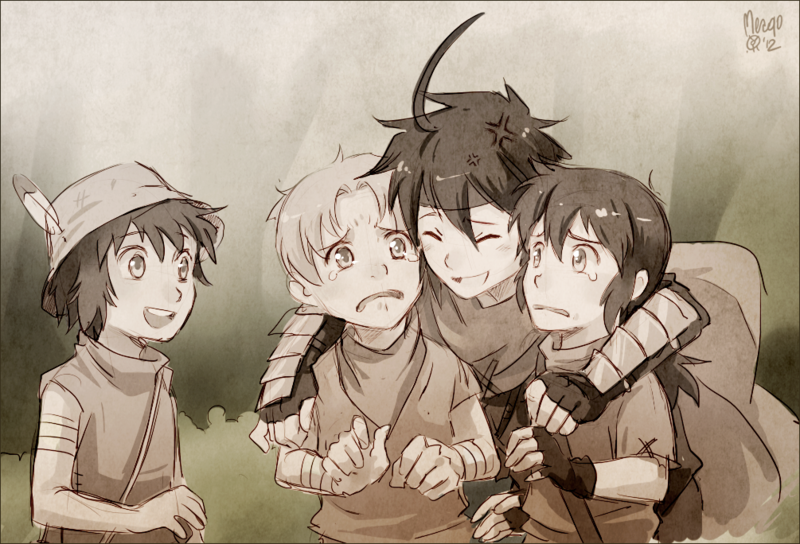 Part of that also comes from growing up as the 'big brother' to a group of kids that he made a 'guild' with. 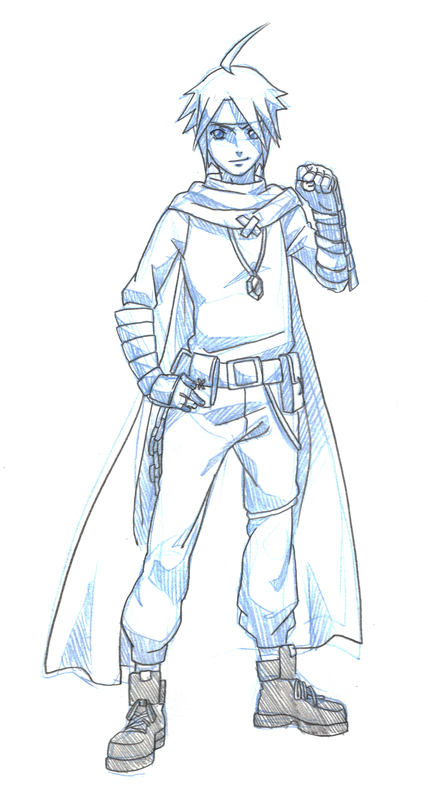 On the flip side, Reize tends to be a bit of a foolish kid. Curiosity overcomes common sense by far, and he abandons the latter a lot when the former draws him. He can be very simple-minded at times, more complex things tend to fly over his head. He is easily impressionable. There are also times when he may leap before he looks, likely getting those who travel along with him into a bit of danger. 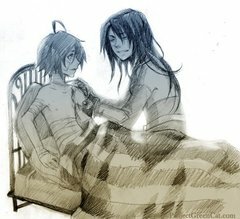 Despite of the faults, Reize does have a heart of gold and is very caring to people. He believes in everything that he does. He isn't completely stupid by any means. He is well versed in knowledge of towns when he has heard about them through stories by bards or generally by his father. His knowledge of towns and other places would be generally basic at most. Granted, the knowledge, as mentioned, would generally be based on heresay. The boy can, however, grow indignant. 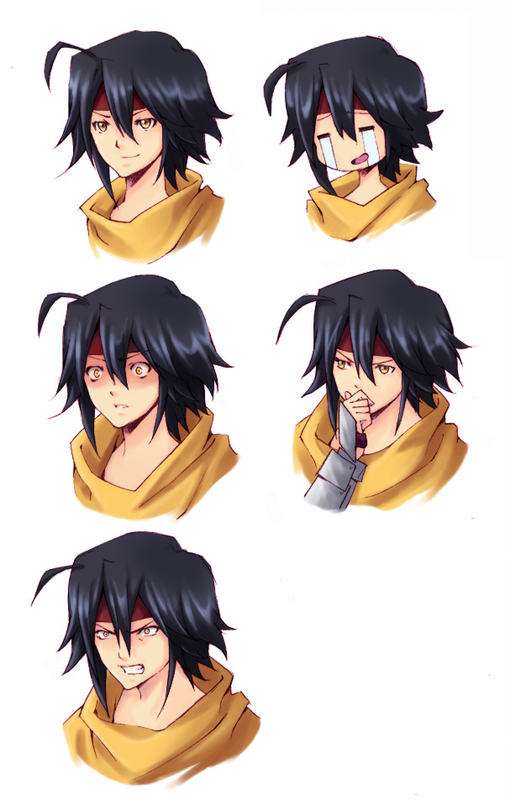 When he does, he tends to puff his cheeks before expressing his defensive nature like a child would. If angered, he acts out of emotion, furthering his leap before looking mentality. 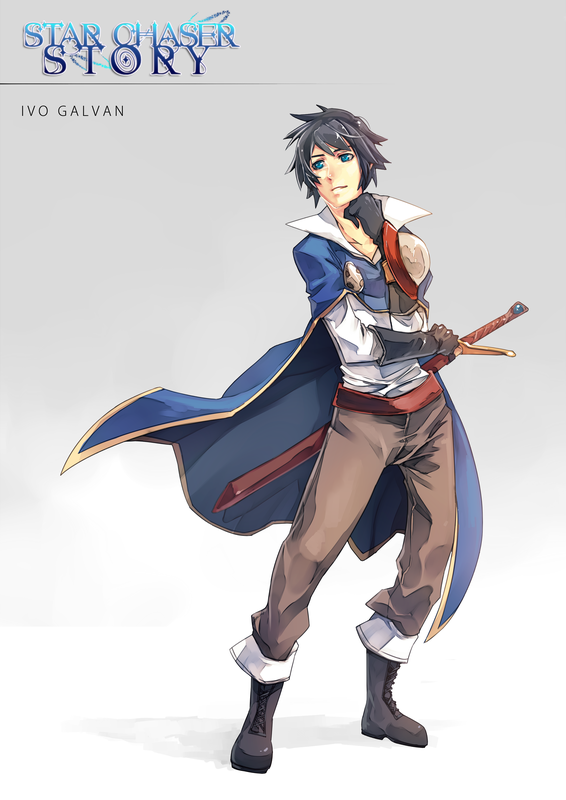 Raised by his father, who was a hero and a knight of his time, Reize has his values based on the Knight's Code. It is his source of wisdom that he tries to understand everyday. He upholds those ideals as a stone, considering that is how a knight is supposed to act. Some of the ideals may be practical, others are situational. 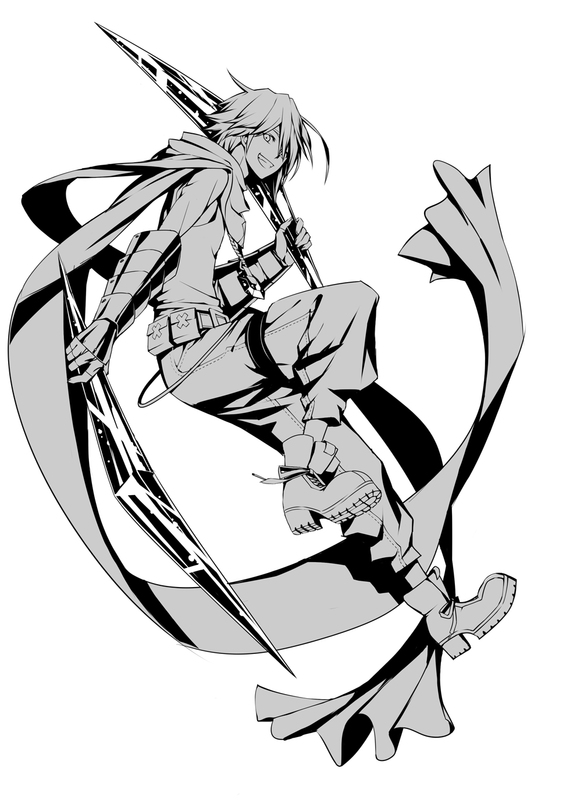 However, Reize holds all of those ideals as a creed and knows them all, strangely, by heart. Though, there are times when Reize would have to deviate from the strictness of it if the intentions are good. It goes along with his idealism that everyone has a bit of good in them. 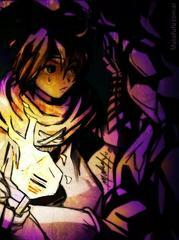 The Knight's Code is the reason for his bravery. While Reize likes being alive, he tends to put it on risk for what he believes is right, following the code. It is when he'll take up 'the sword' to fight in order to defend. Sometimes, he cannot believe that he is risking his life, but he believes this is how the knight's code should be exemplified. It is his courage that guides him. Reize has two personal treasures that he values more than anything. One of them happens to be a pendant that his father gave him. This was a token from one of his adventures and he felt that Reize exemplified how he used to be in his adventuring days. He promises to make his father proud of him and upkeep that idealistic nature. The other treasure is a deck of tarot cards that belonged to his mother. It was a birthday gift that was given to him with the story that his birth mother wanted him to have it. He has never met her, yet with the tarots, he feels that she is with him in spirit. The boy holds an idealistic nature that people, despite how bad that they seem, have enough good in them that they are not totally evil. It is to the point where he will want to believe in it despite the person showing a lack of compassion for what they do. As such, his idealism makes him a bit naive and easily fooled by those that can manipulate the idealistic side. Reize is very trusting of people. He will give a person another chance(moreso than others) and will believe in them, even if they betrayed once. However, he is also prone to taking the betrayal the hardest if the person is close and may end up being less forgiving. In that case, he will only respond with fury. Part of what further complicates Reize's moral life is internal: his wanderlust means that he doesn't want to see events through; he wants to complete the quest and get on with his adventure, which sometimes isn't enough to fix long-term problems, a limitation he recognizes but strains against, with the pendant coming to represent his subservience to other people's wishes at the expense of his own. Reize is also a dreamer. Growing up to the tales of adventurers and heroics by his father gave him the sense that he would be able to achieve a tale one day. 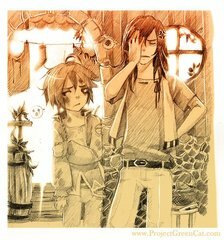 He often looks forward to the day that he would be able to surpass his father and be able to tell about adventures himself. He loves telling stories and hearing stories. Every night, he'll write about the tale of his adventure before falling asleep. The adventure is what drives Reize. It allows him to live the dream. If he is held in one place too long, he will lose the one thing that has made him happy since the gift was accidentally thrusted onto him: The freedom to explore the unknown. This makes Reize seem like a nomad, but he knows that he is has not seen everything and his strongest desire is to see everything. 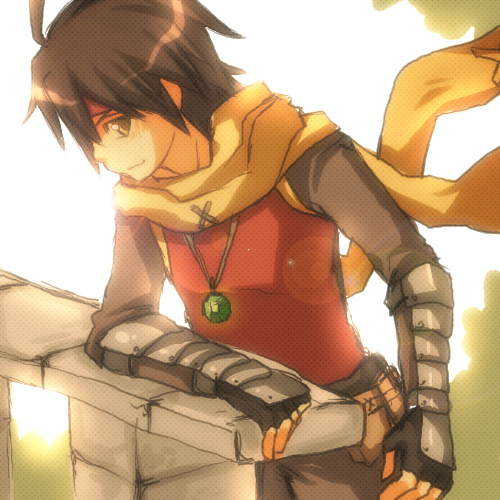 Reize has the aspirations of becoming a knight like his father was. That is why he holds the ideals of the Knight's Code to his heart. He has been given the image of how a knight should be: courageous, courteous, and strong. He hopes to achieve that goal. Another goal is to be able to tell stories of his own adventures. He keeps a log book with him to record his chronicles as he journeys the world. It is bard-like in someways, but he learned to develop the oratory way of telling stories to the younger children as the 'Big Brother' of his 'clan'. As such, he is skilled in his ability to tell story by word of mouth, but his writing could be improved on. The one thing that he wants more than anything is to find out who is mother is. For the many years growing up, he grew up without a motherly figure in his life, no knowledge of her, and his father never devulge in that information. It infuriates him, vowing to find out for himself. After all, he believes that his mother still loves him, otherwise, he would not had been given her personal treasure as a gift. Maybe, she is still traveling the world. However, why? Other part of him wonders if she is in danger. 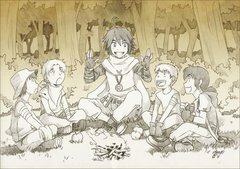 There are not too many interesting things for small village kids to do, but one of them were listening to tales of adventure and heroics. 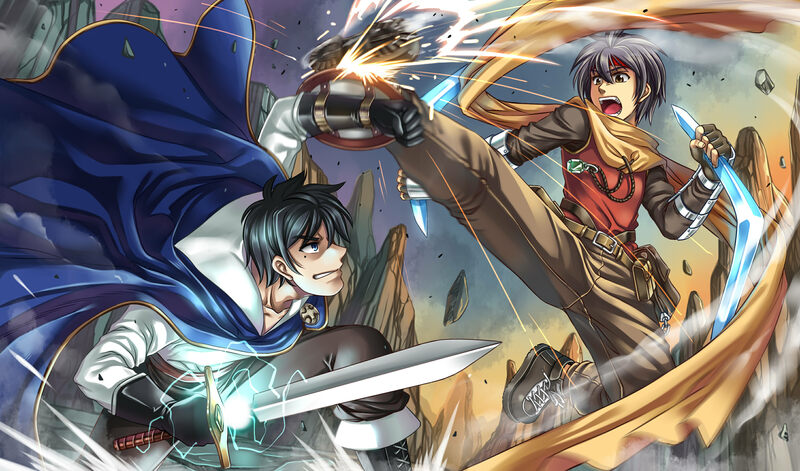 Reize grew up to his father's tales, which inspired him to become an adventurer. 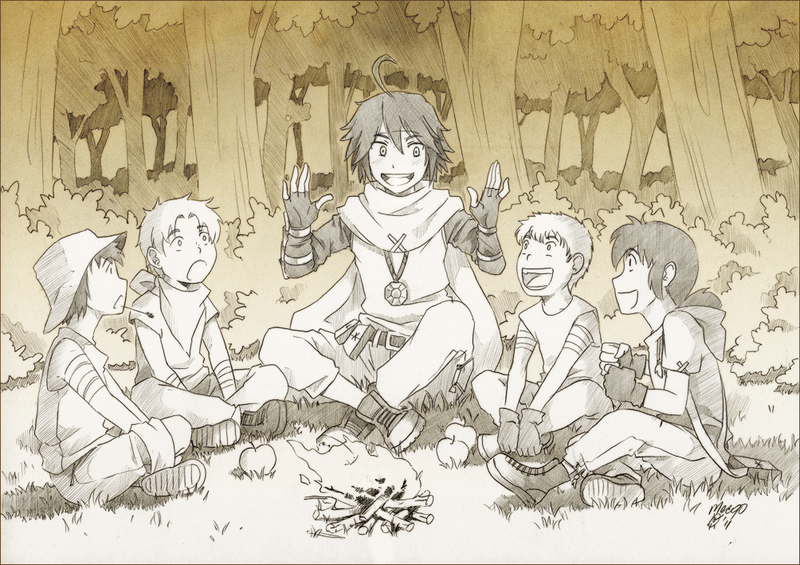 He tends to share the stories about his father or his own adventures with those younger than him. Reize is a skilled orator when it comes to telling stories to the younger children, putting his passion into every line he speaks, unafraid of exaggerating the lines with animation for more effect. On the other hand, Reize loves hearing other peoples' tales and is interested in hearing them out, even sometimes bugging them for a story. Being near the body of water will draw inspiration to relax on a raft or fish. More often than not, Reize would prefer to fish, finding it relaxing to just sit back and enjoy the atmosphere. Unless it is out of hunger, Reize will not use any effort to try to catch a fish. His travels has given him a nice activity to do. 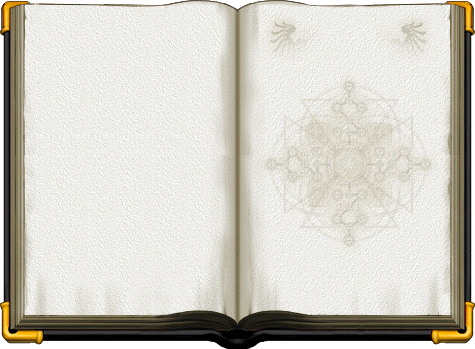 Inspired by his mother's paintings in cards, Reize opted to keep a small journal to note only keep a summary of his travels, but to also keep track of the monsters that he encounters, essentially carrying a Monster Book(or Bestiary). 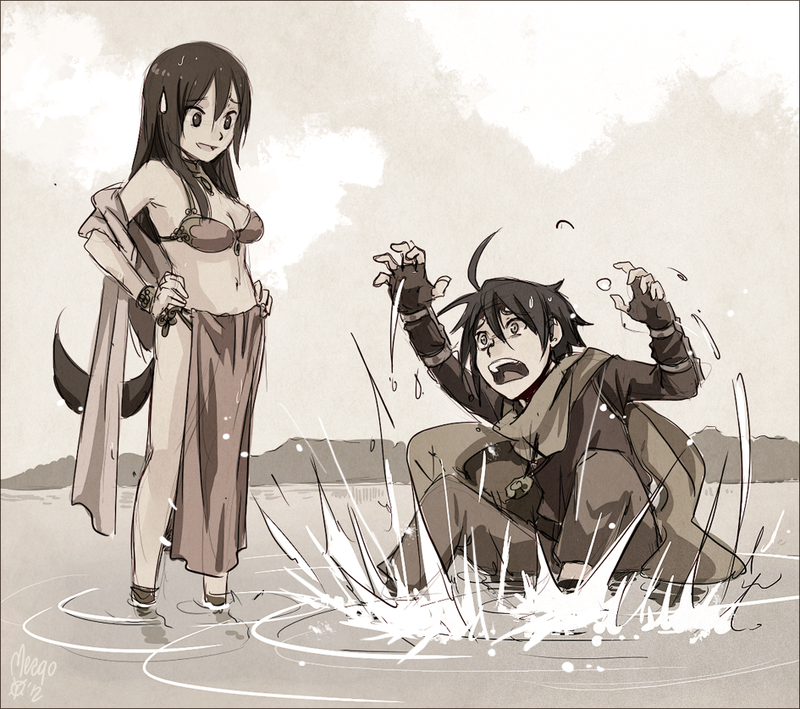 One of Reize's worst enemies is water. When it comes to being in a large body of water, he tends to panic. 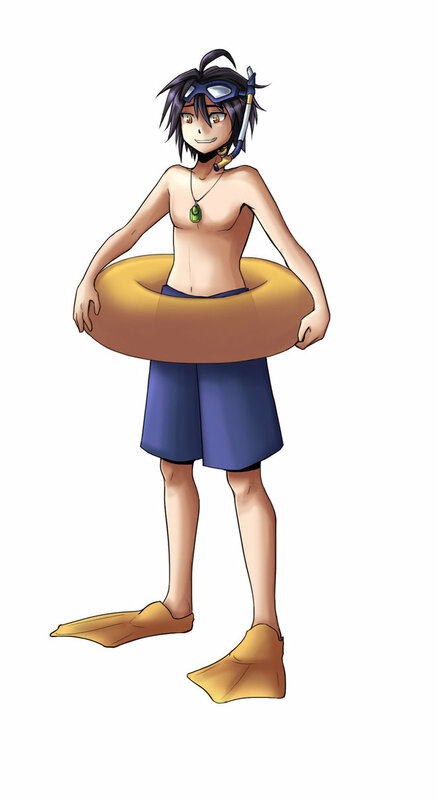 This is mostly for the fact that he cannot swim(without some sort of protection). Even if he is in a shallow amount of water, he will still panic, acting like he is drowning because of his over-exaggerating imagination getting the better of him. If he is on some large boat where there is a lot of rocking, he is prone to seasickness. Expect for him to get comically incapacitated for a while. If having to come down with the fact of killing, he would be afraid to. He'll outright refuse to take another life because he is afraid of doing it. Sure, he kills wild animals in the woods when he needs to eat. It is a different mindset of killing sources of food and taking the life of another human being or the likes in order to survive. There are a certain amount of quirks that Reize possesses. One of them tends to be that he is navigationally-challenged. If he is leading the path, it is likely that those that are with him are likely to get lost. He believes that he is going the right direction, but often times not. There is the misfortune of also appearing in the wrong place at the wrong time. 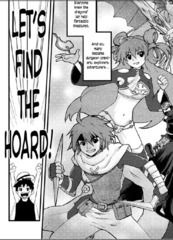 This goes hand-in-hand with his inability to navigate himself to a certain location. It is often times that he will show up in the middle of a battle between warring groups or come in as a thief escapes, having the situation implicate him as the culprit. When Reize is feeling stressed, he often either grabs onto the pendant or to the painted cards, more than likely playing with the latter. 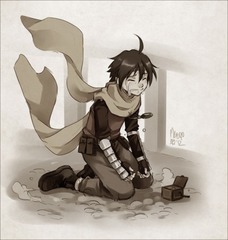 When he grabs that certain treasure, he is thinking about the respective parent that gave it to him. The manner of his speaking has an odd phrase. Reize particularly uses "Mada mada" in the sense of "Alright, alright" or "ugh". Uncertain why he uses that phrase. It probably sounds good to him. 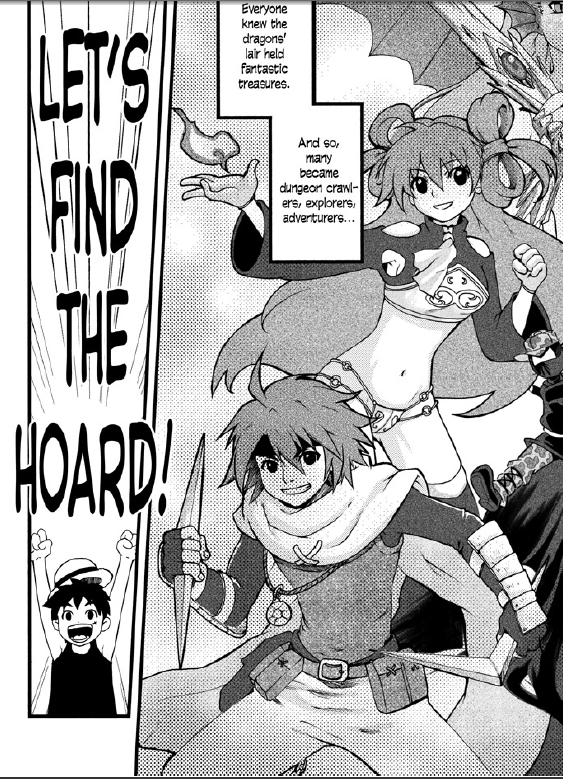 He also tends to collect knick knacks along his trip that may prove useful in the long run. They will likely be utilized from his bag of tricks. One of the more notable features, physically, is his antenna hair; that strand never tends to go along with the rest of his hair. The strangest thing is that the strand of hair tends to express itself in the same way that Reize does; it will sigh as he sighs, stick up when he's surprised, crumple when he is hit, and so forth. It's one of the features that generally draws curiosity from his friends and those that learn of him. Reize tends to be a bit reckless. Perhaps it is due to his naivity, but Reize tends to leap before he looks. He charges into situations without thinking with the consequences; views tend to be black and white. If he feels that the person is doing harm, he will charge in to fight against those who harm the weak. When he does fight, he prefers to be close up and within the melee range as possible. As a boy who fights using kicks, he likes to take the aggressive side to put pressure on his target of choice. 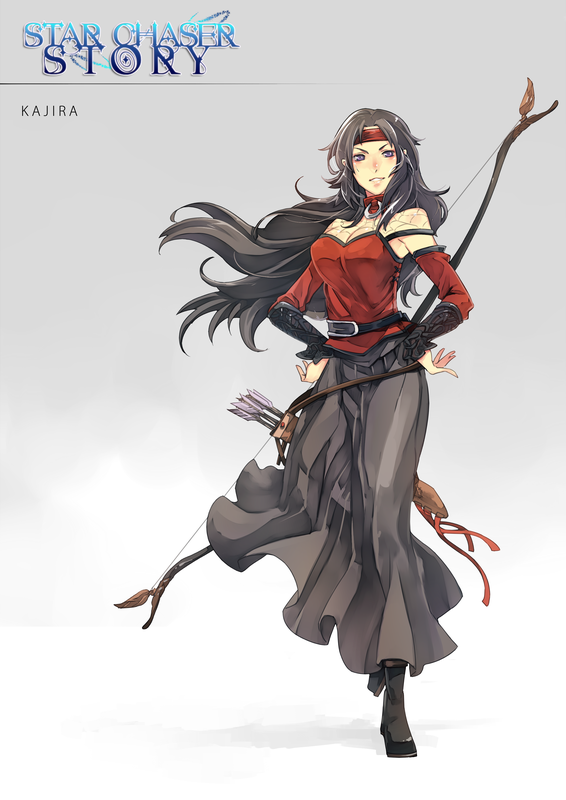 However, Reize can think tactically. If he is within his forest surroundings, he can use that to his advantage. If he is given a tool, he will use that to his advantage. If he gets an idea that will outwit his opponent, he will utilize that. 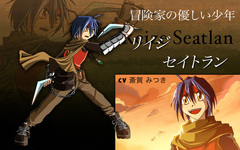 Although Reize has been trained to be a hunter, he cannot take a human life. In fact, he is unwilling to take a human life. This goes along with the fact that Reize will never use a sharpened weapon. To him, the sharpened weapon's intentions is to take a human life. If left no choice but to use a sharp weapon, he'll use it as a tool to outwit his enemy. If nothing else, he wants to disable his opponent. However, some inhuman creatures such as the undead would have to be exempted from the role. Animals are exempt only due to the fact of the rules of a hunter: You kill it in order to eat and survive, no more. Despite all of the times that Reize may likely get himself into trouble, Reize has the ability to adapt to strange situations. Being a village kid, he was taught to be an well-rounded person physically and mentally. This can be attributed to his ability to persuade his way to get himself out of the situation. He often tries to play off on getting onto the person's good side. Physically, Reize likes to be prepared, often carrying tools for the occasion that the time arises ranging from rope to torch wood. He grew up under his father's handy-man like ethics. Like many humans, Reize can learn from his mistakes, adapting to improve himself. 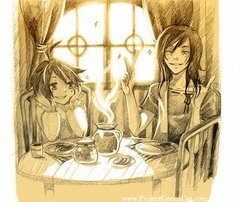 There are different aspects of Reize's relationships ranging from his father to females in general. In particular, Reize looks up to his father. 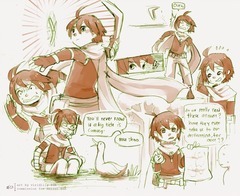 He grew up to his father's tale of adventures, appreciating the heroism behind it and aspiring to be like him. 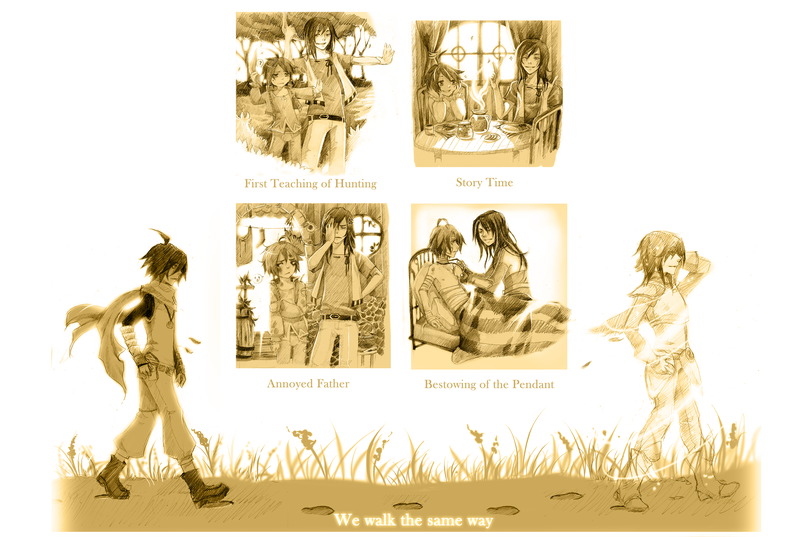 Although his father was strict, Reize knows that his father cares for his well-being. 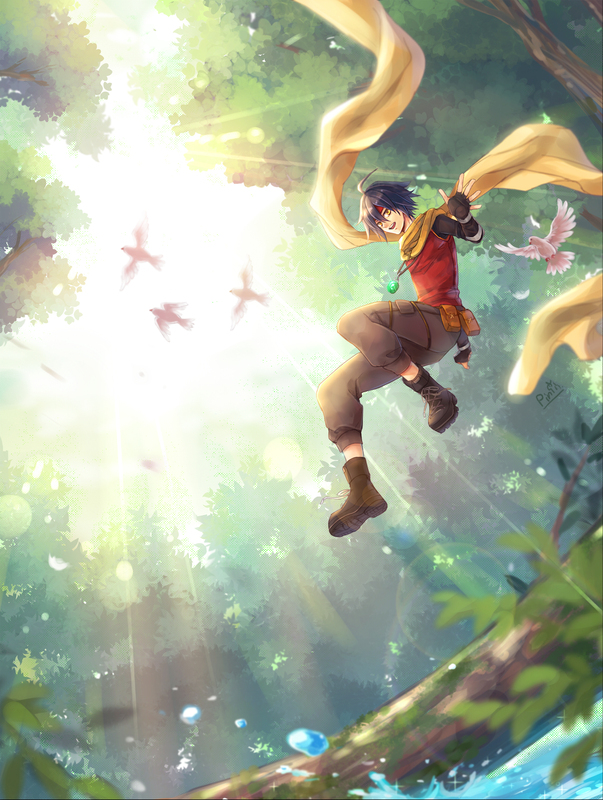 On one hand, Reize misses his father, but he is in no hurry to return home with the newfound freedom of being able to explore. Granted, he doesn't seem to consider how worried his father is for Reize being out on his own(especially when he doesn't know how Reize disappeared in the first place). 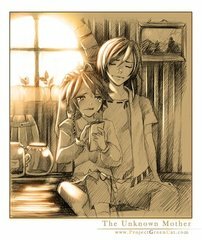 Reize never had a motherly figure in his life growing up. In that respect, he doesn't know what having a mother in his life is like. Due to that, the subject of mothers tends to be a touchy subject that may cause a damper in his normally cheerful self. Seeing someone reunited with their mother, for example, will pang in his heart. Part of him would feel happy for them, but the other part of him feels a knife twisted, something that he wanted to find but could never have. Siblings are another matter. 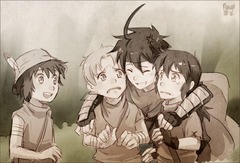 Reize is the only child, so he was regarded as the big brother by the kids of the village. As such, he has developed he mentality to be protective over the younger kids. Girls in general are a different topic all together. The interaction with them is a bit odder than most people. He doesn't mind traveling with them or even interacting with them. 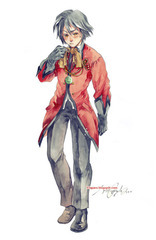 However, he tends to get uneasy around those that are romantically-minded. He finds girls weird and practitioners of the dark arts known as cooties. Displays of affection between other such as kissing tends to make him wince and cringe while those directed at -him- will cause him to panic and become apprehensive. Sometimes, it comes out comically to where he'll fall off of what he was standing on to avoid such. Granted, those that are successful are likely to get a displeasured noise from him. The exception may be to those he take a paternal instinct to, but that tends to be tested at times. Mind, as he is coming of age, newfound feelings towards such tends to be confusing for him, and his reactions are hard to express when it comes to confusing situations such as this. Overall, he is far from unaware from telling if a girl has feelings for him. With his tendency for being empathetic, he is well aware of it and he tends to go into panic mode if it becomes a bit more overt because of the belief that he has of girls and the struggle with potential feelings that are coming from him as he is becoming more of age. The supernatural is treated along the side of the unknown. It is what amazes him and what he seeks to explore. He is willing to journey to learn more about the unknown and experience it for himself. He wishes to see what those before him failed to see and regard it with an open mind. After all, an important part of being an explorer is to carry an open mind. It amazed him when he saw the mythical beast for the first time. He plans to keep a log of all of the creatures that he encounters, especially the ones painted on the cards by his mother. 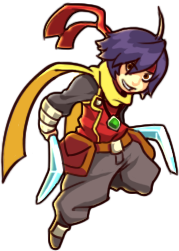 Battle Prowess: Analyzing Reize's full combat capability, Reize's strongest points is his exceptional agility, second by his accuracy. His style consists of putting pressure on his enemy for tactical advantage. However, his strength and endurance are a bit average at best. He is not ad durable as well as the average warrior nor is he able to dish out the damage. There is great raw power in him in terms of magic, despite of it being unhoned. 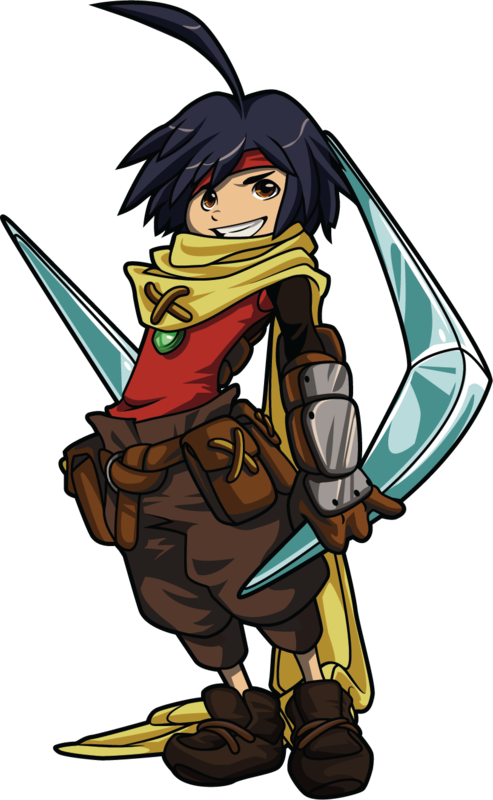 Battle Style: Reize's main weapon style involves dual-wielding boomerangs with ambidextrous precision. Primarily, Reize wields his boomerangs as if they were twin swords, but is also capable of throwing them and catching uncanny, even unlikely rebounds and returns. This is complemented by the self-taught martial arts style, focused on his kicks and his speed. Wilderness Survivability: Spending his entire life in a forest-based village has given Reize some experience in handling "Forest-type" surroundings. He is an adapt hunter, using his boomerang to catch food. One of the more known traits of a hunter is tracking; he is capable of following a trail that'll lead to its point of origin. Although limited on the field, Reize is capable of cooking the meals that he catch. Even in the most adverse weather, he is adaptable to surviving in harsher environments through the use of using his intuition and surroundings. Jack of All Trades: Reize can adapt to tasks that do not require extensive learning. Even if he is not initially good at it, he can quickly get the hang of the subject adequately. Unfortunately, for whatever reason, this does not involve 'swimming' or 'navigation'. Storytelling: In a way, Reize is has a bit of a bardic ability of handling storytelling. This comes in both writing and oral. He is exceptional with keeping people interested in the story, leaving them wondering what else happens in the story. 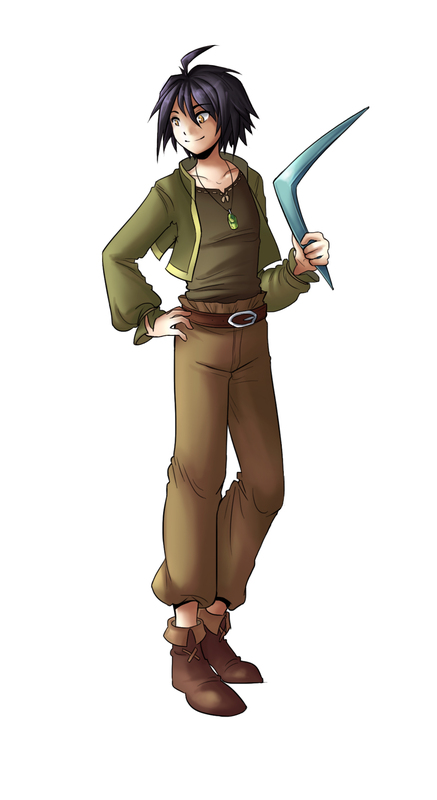 Tools for the Situations: As an explorer, Reize is used to carrying many things with him in his back pack and pouch. It can be simple stuff as an apple or perhaps a grappling hook. It always helps to be prepared. 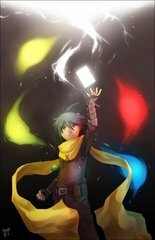 Magical Aptitude: Reize has a knack for picking up most magical devices and simply use them despite lack of prior knowledge of origin or capability. These types include: wands, crystals/stones, weapons with magical properties, and Reize's unusual pendant. Magic - Pendant: Reize's mysterious pendant is a wellspring of magical power that responds to his will and emotions, particularly determination. 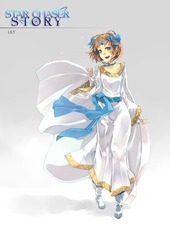 In truth, it responds to everyone's - it is a beacon for hopes and dreams, and has the potential to grow in power as he affects others' lives by fulfilling their wishes. He's prone to experiencing strange dreams about such wishes while wearing it, hopefully providing hints. Defaults to Base Combo attack and Support Ability better used in RPG-related settings. 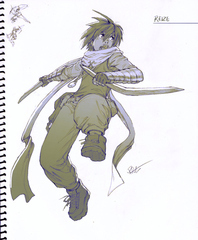 Reize performs a burst that combines his self-taught martial arts and the use of his dual-boomerangs: a slash, kick, roundhouse, double slash. Reize is a very versatile fighter. As such, the way that he holds his boomerangs will change his entire fighting style. 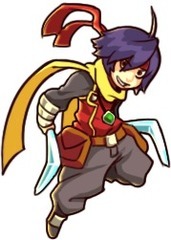 He'll is capable of switching to a different stance with his boomerangs at a moment's notice. Forehand Grip - Keep-away tactics are used. Inverted Grip - Aggressive, rush-style Bursts are used; sacrifices defenses/cannot block. 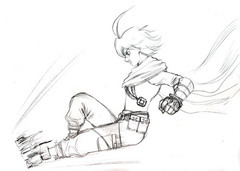 Reize performs a rapid kick and then will finish it with a hook-kick at his target. 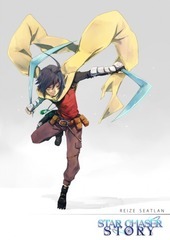 When Reize successfully evades an attack, he'll back forward and will move in a blinding speed to appear behind his opponent, allowing him to exploit a surprise attack. Through the pendant, Reize is able to draw upon magic. A tarot will manifest as the pendant glows, then the tarot will materialize into a spell. See Pendant's Power for options on spells. This Exceed Burst skill is Reize utilizing his agility to its maximum potential. 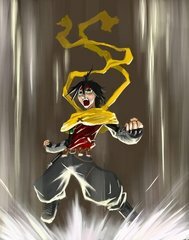 He gathers his will together to unleash a multitude of strikes from all directions, then he'll end it with a smashing kick to send his opponent planted to the ground. 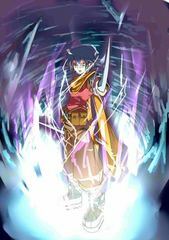 Pendant's Power Effects: Once invoked, the pendant's magic manifests in various ways. Upon cast, A ring of globes ignite to life around Reize. And then, it'll travel straight towards the intended target. Upon impact, it explodes within a short range. This is used for recording all of the monsters that Reize encounters on his journey. This will detail out their modus operandi, where they can be found, and tactics used to overcome them. This is a gift from Luan, which was a gift by a mythical creature. The jewel is a strange shard, the source of Reize's ability to utilize magic, but there seems to be more to the pendant than what was told. This is Reize's pouch. 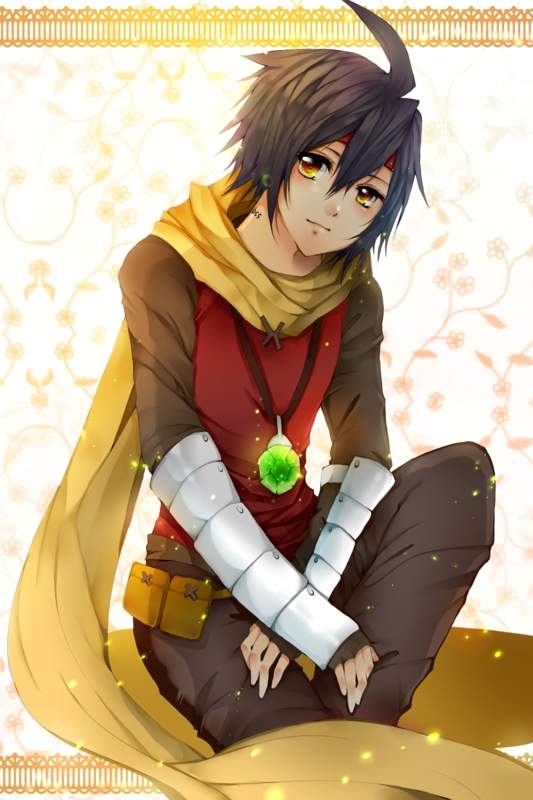 He generally keeps some of his trinkets and other sort of interesting items that he finds inside of it. However, due to the fact that it's very unorganized, he often finds himself pulling out random items to use in the situation. A shooting star symbolizes a fleeting moment in one's life. It is filled with the wonder of mankind and is sometimes regarded as the symbol of reaching one's ultimate destiny or even a chance of a better life. 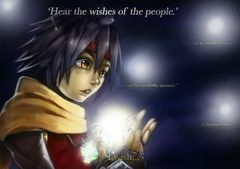 As such, people often make wishes upon that fleeting star. In a way, it takes those those dreams, hopes, and wishes and carries them passes through the sky. 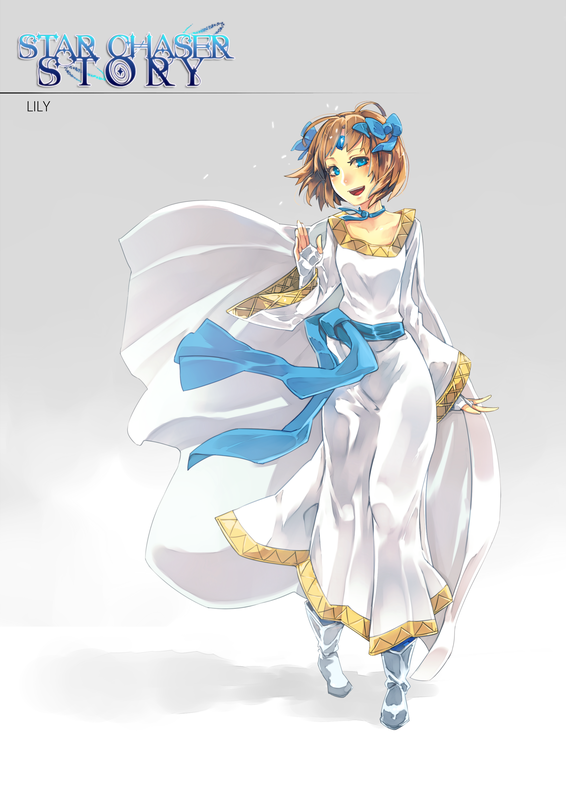 During the course of its journey, it breaks apart as it falls towards the earth along with the wishes of mankind. The shards often land within the earth, mostly within the magical essence. However, because the shards have broken apart, it does not hold the charge that it once did as a full shooting star. Yet, it does retain quite a bit of power. While not able to grant wishes in its current form, it does hold a gift for those who possess it. The shards react strongly to those who have a high sense of imagination and wonder, and faith in the former two. Often, it is normally children because they often carry those important traits. After all, if they believe it is real, then they are rewarded with the sight. "Open your mind, open your heart, and the truth shall be revealed to you." Ether Eyes: One of the gifts that is presented is the ability to see the flow of magic in the air. They can see the aura that manifests from those who channel it as well as the traces of magic left in the air. This will allow them to have the aptitude to judge and evaluate the magical forces as well. Limited Access Magic: The shard carries a limited amount of magical power that the user can use daily. Though the pendant, the user can manifest its power. When gathering the magical essence, the user's particular focus will manifest. The strength of the magic's power is relative to the user's sense of imagination and wonder. Magical Resistance: Because their mind is opened for the truth and is able to see magic, this provides a small amount of protection from the effects of the supernatural. Bond - Wishes of Mankind: A shard has the potential of growing stronger with the user based on the lives s/he affects in a positive sense. As the user makes the wishes come true, there is a bit of belief placed onto the user. This bond allows the shard to grow in strength to even one day regain the strength of a full shooting star. The great beasts around the world see the shooting star as part of the divine way that the world operates. As such, they treat it with great respect and are wary of humans having their hands on it, for they tend to corrupt its power. As such, they try to keep it out of humans' hands whenever possible. While the source of the pendant's power is fulfilling people's wishes, the pendant does not discern good from bad wishes; if someone's deepest wish is selfish or evil, the pendant will respond and reward Reize for granting it, as it does not punish him for not fulfilling wishes or even preventing wishes from being fulfilled (important for stopping bad guys, but also means that hurting people doesn't matter). 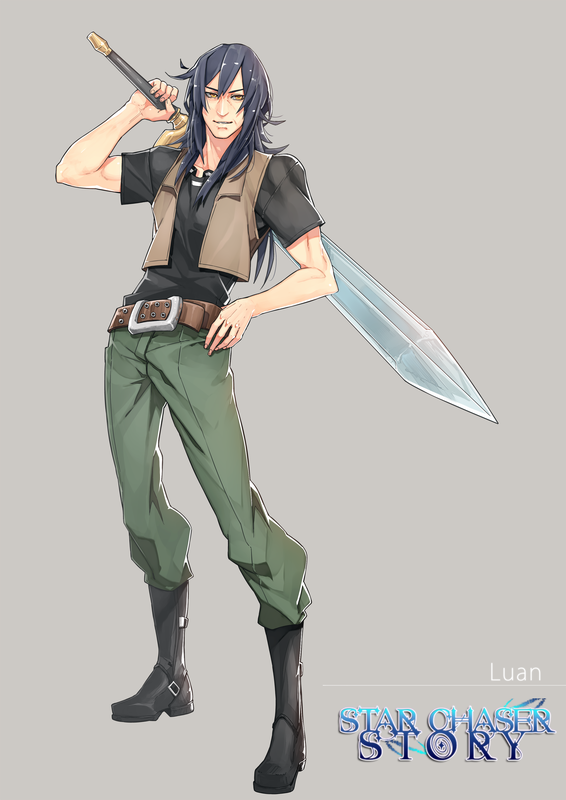 The Knight's Code are a set of proverbs created by Luan to instill some morals and code of ethics in Reize. Although they were made, Reize treats them as if they were real codes of the Knight. First Vow: Always help a person in need. Second Vow: Act honestly, answer boldly. Third Vow: You can do anything if you try. Fourth Vow: Never forget the basics. Fifth Vow: Even a small star shines in darkness. Sixth Vow: Courage is not living without fear, but it's facing that fear. Seventh Vow: Mistrust breed nothing good. Eighth Vow: Never forget that everyone is a person deep inside, even those that may not seem so. Ninth Vow: It's better to be deceived than to deceive. Tenth Vow: Not all right choices are the smart ones. Eleventh Vow: Sometimes, the right choice is the one that hurts you the most. Twelth Vow Every day you sleep, look back at it and then prepare or the next day. Thirteenth Vow: Knowledge not shared is knowledge lost. 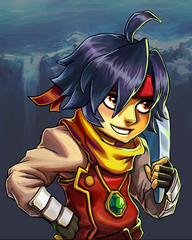 Fourteenth Vow: He who takes his sword in revenge takes the first step in plunging his heart into the abyss. Fifteenth Vow: It's easier to point a finger than offer a helping hand. Sixteenth Vow: You can fix anything but a broken promise. Seventeenth Vow: No matter how mountainous the adversary, standing your ground is key! Eighteenth Vow: Cross even a stone bridge after you've tested it. Nineteenth Vow: Anyone can strive for their own, but it takes a bigger person to strive for others. Twentieth Vow: It's better to begin in the evening than not at all. Twenty-First Vow: Impossible just means no one has achieved it yet, so strive to achieve! Twenty-Second Vow: Sharpen your mind just as you would sharpen your sword! 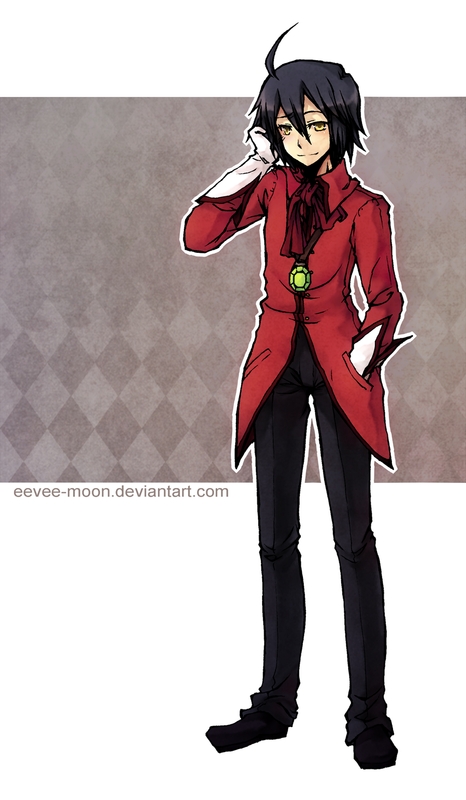 Twenty-Third Vow: One bad egg can spoil the rest of the batch. Twenty-Fourth Vow: A bad workman always blames his tools. Twenty-Fifth Vow: Worrying does not revert the past. Twenty-Sixth Vow: Follow your heart and let your convictions guide you. Twenty-Seventh Vow: Fall down seven times, stand up eight. Twenty-Eighth Vow: Swallow your pride, as it breeds nothing but disaster. 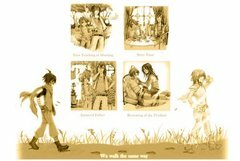 Twenty-Ninth Vow: One can walk a path alone and reach a city, but with a companion you can reach the world. All of the tracks embedded in this tab have been composed for me. Each section will have a small blurb about the composer in question. Although an amateur composer, his music is pretty good. His price was good my character got his own custom themesongs. I came across him back around 2013 when I wanted to hire a composer to do a themesong for Reize. He and another person caught my attention, but I selected Joseph after my friend's recommendation. These two songs are the results. On another note, he is getting into voice acting. For those unaware, Hiroki Kikuta was the composer for Seiken Densetsu 2 & 3. Getting a hold of Kikuta was an adventure. It started with seeing a reddit AMA dating back around February 2014. One month later, I contacted him on Twitter and found that he was available for hire. Through a liaison who turned out to be a friend of a friend, we went back in forth in communications and getting the song composed. 23 October 2014, Original song, "Summer", was completed. I indicated that I liked the sketch version as well, so I received what is titled "Spring" was on 25 October 2014. Both songs received their official titled as of 14 January 2015. 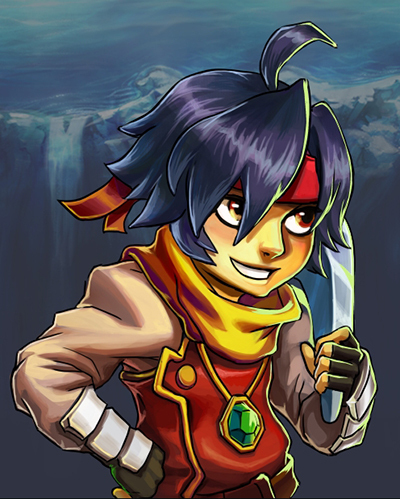 Profile: Growing up in the simple hunting village, the 14-year-old Reize was raised upon stories of exploration, adventure, and heroics by his father, a once well-known explorer and adventurer. 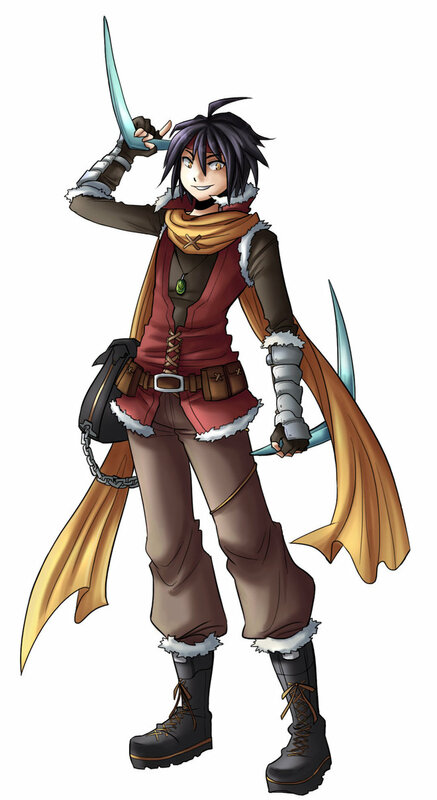 Enthusiastic and compassionate, Reize makes friends easily, and he is idealistically committed to his own imagined 'Knight's Code', despite their ambiguity. Though his bumbling and lack of navigational abilities tend to cause him to show up at the wrong place at the wrong time, he is nevertheless eminently adaptable, and now on the path to becoming an explorer. Profile: A group of evil knights is terrorizing the countryside? Reize Seatlan is on the scene! 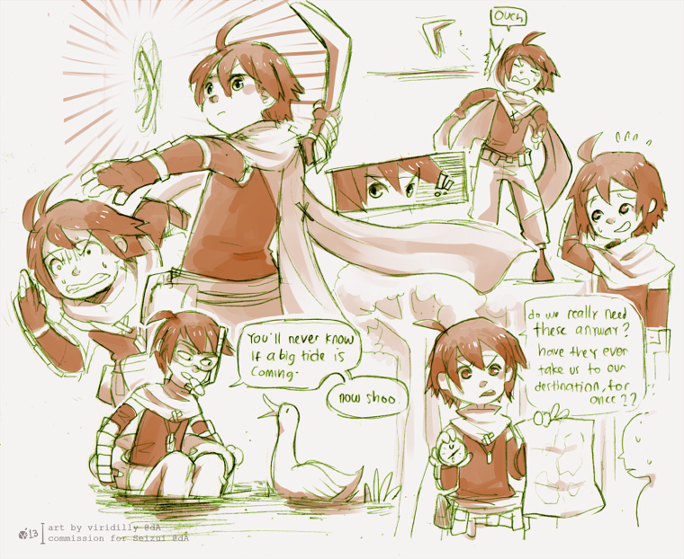 This plucky young adventurer travels the land, helping people in need and following his own invented Knight’s Vows. But which of these knights are good, and which ones are bad? Reize is a bit naive but always well-intentioned. 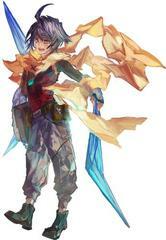 He uses two crystal Boomerangs as weapons. This section is dedicated to thanking those who have been involved with helping me with Reize's development through the various artworks, music composition, and overall idea bouncing. I will credit folks accordingly.